Having listened to them for years, seeing them live legitimized my unfathomable adoration for their music. On Thursday Nov. 2, Fall Out Boy proved their place in the music world with their Mania tour. At Eaglebank Arena, Fall Out Boy stopped by to promote their upcoming album, Mania (2018), which is set to release in January. The concert was beyond exciting; they rocked the house as fans screamed the whole way through. Jaden Smith, celebrity child and musical prodigy, opened up the concert, which came to be much of a surprise. He opened to get more buzz on his upcoming album, SYRE: A Beautiful Confusion (2017), which is expected to come out Nov. 17. His performance was unique and something that I had never witnessed before. His music videos projected behind him during the performance, and the deejay cueing the music was rather hidden in the corner. Jaden Smith’s performance was interesting – not the best, but did a nice transition outside of his acting work. 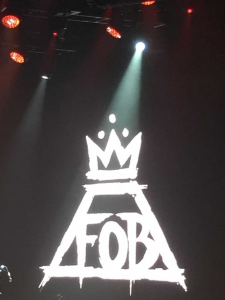 Matthew Tyler Musto, namely blackbear, was the second opener for Fall Out Boy, and wow! The L.A. based hip-hop artist did a phenomenal job, and left the crowd in awe and closed off the set his hit single “do re mi“, featuring Gucci Mane. Then, Fall Out Boy took the stage. They opened with their hit song “The Pheonix“, the opening track off Save Rock And Roll (2013) – an introduction that caused true mania. It was absolute fire… no really, actual fire! There literally was fire spewing from the stage, which came to be a timely element that connected with the high energy generated between fans and the band. Following several songs from Save Rock And Roll (2013), they switched up the setlist a bit with new songs, presumably off of Mania (2018). The encore was wild – they riled up the crowd with hits like “Uma Thurman” and “My Songs Know What You Did In The Dark (Light Em Up)“. The concert was beyond my belief – it was an unforgettable night. Having listened to them for years, seeing them live legitimized my unfathomable adoration for their music. Overall, Fall Out Boy’s Mania concert left me satisfied and hungry for more music, not just from the band themselves, but blackbear and Jaden Smith too.